Well, here it is. You have found the most important page in my whole website! I am glad that you have arrived at this page, and would be honoured if you would spend some time reading about how God has changed my life in so many different and wonderful ways! I grew up in a semi-Christian household. My mum is a Christian. I grew up going to Sunday School at Viewfield Church in Stirling and met lots of Christian people who taught me all about God. When I was 10, my mum told me that I could choose whether or not I wanted to go to Sunday School. I decided that I would prefer to sleep in and watch cartoons instead! When I was 12, a mission team came to my Church, and I had lots of fun playing all the games and learning all about Jesus, but I still decided that I preferred sleeping in to actually getting up early on a Sunday morning! Although I didn’t know it at the time, God was still at work in my life; he wasn’t ignoring me, even though I was ignoring him. It was at this point that God gave me some skills to bring me closer to serving and worshipping him. When I was 15, my parents gave me a set of juggling balls for Christmas, and I developed an overwhelming desire to learn the art of juggling. Within a matter of weeks, I had mastered the easy 3 ball tricks, and began learning more advanced patterns. I still didn’t realise that God had given me a gift, but within a few months, I was performing at Charity events. I kept on learning, and moved on to more and more difficult tricks and bought new equipment such as the diabolo, devilsticks, spinning plates etc. This was quite a miracle for me as I was painfully shy growing up and now I was wanting to be the centre of attention! Although, I never lost the willingness to learn new tricks, perform routines and master new juggling equipment, I was still not going along to Church or praying. When I was 17, I left my job and had a summer free before I started at College. I was asked to put on a show for a group of people in Perth who were on a training day for a children/youth mission to Dunbar. The Dunbar team was made up of about 20 Christians of all ages and talents, and after my performance, some of them asked if I would consider joining the mission team. I said yes, and a few weeks later, I was on my way to Dunbar to meet up with the team, and I spent a week helping to run Children and Youth events as well as being the crowd gatherer for their Christian Street Theatre sketches! (Steve is bottom-left of this photograph)! 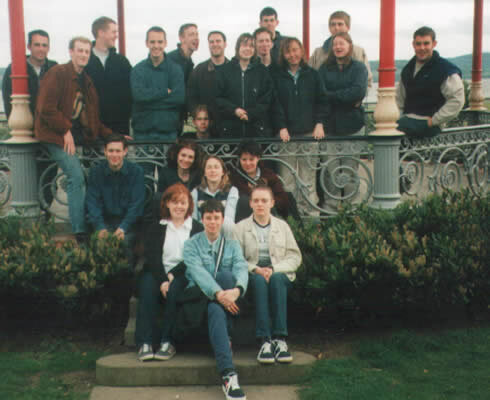 When I was 18, I was asked if I wanted to join an Easter Mission team in Perth. At the end of this mission, I was asked on to another 3 or 4 teams for the summertime, and I ended up going on all of them! God was working in my life, and I was using the talents he had gave me to entertain people all over Scotland. God knew I was a shy person, and through time, he began to take my shyness away by giving me a great group of friends on these mission teams. When I went to University, I became involved with my Christian Union and became the e-mail co-ordinator. This allowed me to encourage everyone in the CU through the use of e-mails, attachments, bible verses etc and it was a joy to watch the number of e-mails around the CU grow every day! I also started to go to Central Baptist Church and really enjoyed the teaching there. 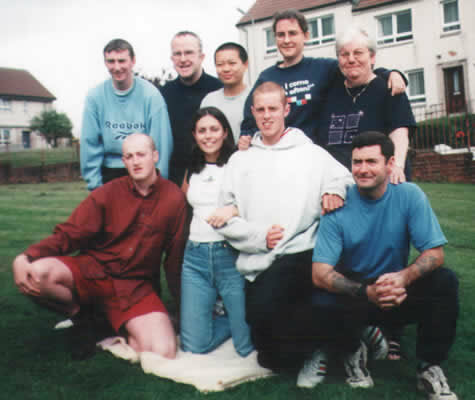 During the summer between my third and fourth year at University (1998), I joined the Church of Scotland CORE Scheme, which is a scheme that enables young people with mission experience to do mission work for 8 weeks. My faith grew considerably in this time. In January 1999, I got an e-mail from the Church of Scotland Mission Co-ordinator to ask if I could build a web-site all about mission for the Church of Scotland. He knew that my Honours Project Dissertation was entitled – “Applying Human-Computer Interaction Principles to Web-site Design”. When I had finished the site, I knew that designing websites was the type of work I wanted to do full-time, so God had helped me once again to realise where my life was heading, and guided me to my chosen careers (web design and juggling). 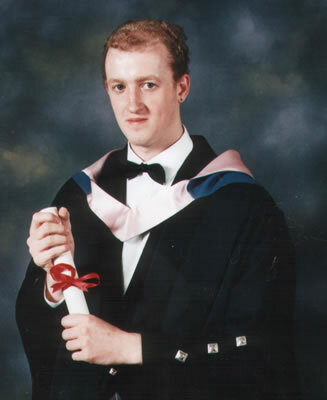 God has looked after me every step of the way since I graduated from University on 3 July 1999. On the weekend that I moved out of University and back home, I was a Youth Counsellor at Festival ’99. It was very moving seeing hundreds of people all come forward to be saved. I had the privilege of counselling three such people. 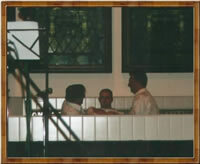 On 6th May 2001, I was baptised along with 4 friends at Stirling Baptist Church. God means so much to me, and the feeling when I came up out of the water was awesome! 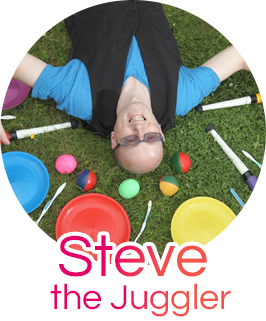 On 16 July 2001, I launched my new business as a self employed Professional Juggler and Website designer! In recent years, I have given up the web design side of the business, and focussed on the Professional Juggling side of the business.I developed my Juggling to involve telling the Gospel through juggling, and now have a full one-hour one man Gospel Juggling Show! One more indication of the way that God is steering my life and helping me to get involved with many outreach activities all over the UK! I now live in Rushden (East Midlands) and have joined Park Road Baptist Church as a member where I am involved in various Children/Youth ministries, as well as attending Homegroup and Church every week! Even in the early days when I didn’t think much about God and ignored him, he was still thinking about me and preparing me for the day that I could declare my faith in front of a church and then follow him, and do what he asks of me. He has given me so much out of life. I have made wonderful friends. God has given me the ability to juggle which I am very passionate about. Who knows what the future holds – the sky’s the limit! God has given us all gifts. We just have to learn what they are and practice them. He will then give us many opportunities to glorify him.God is at work in all of our lives. We may not realise this, but it is true. If you are good at something, then consider using this talent wherever possible to tell others about God. He has changed my life, and I know that he is at work within all of you. I encourage you to realise your gifts and use them to God’s glory. Don’t be modest! We all have talents. Everyone is good at something, and enjoys doing certain activities. Please pray to God for the opportunities to use your talents and keep developing them. I encourage you to consider becoming a Christian. Please contact me or make an effort to find out more about the life that God wants you to live. God is real, and involved in all our lives. Please consider this way of life, AS IT IS THE ONLY WAY.